This is the sitting area of our living room. We spend lots of time here so it's important to me that it looks nice but is also inviting and comfortable. The sofa is rather special to me because it was (and is) my first real sofa. 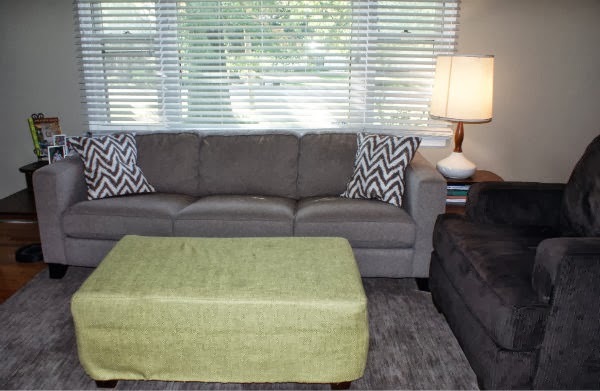 Everything up till this sofa was purchased second hand and spruced up with a slipcover. Since starting our house revamp last fall, the only things I've really done are paint the walls and make some toss pillows. Lately I've been considering ways to give the room a cohesive and stylish yet comfortable look. This is where Polyvore comes in. I've only used Polyvore a couple of times, but I am completely hooked! It is the handy dandiest tool for planning a room - no Photoshop skills necessary! I started by finding some furniture that matches the general shape and color of our existing pieces and then started playing around with ideas. I'm so excited about what I came up with! I think I'm going to be able to whip this space into shape with a few small changes. 1. I have a vintage tension rod lamp, but I'm not keen on the color. I think a coat of black paint will look great. 2. I made brown and white chevron toss pillows for the sofa a few months ago, so those are covered. For this plan, I'd like to have four more pillows in mixed textures and prints including kilim, ikat and faux fur. I'd also like to find a quirky or whimsical toss pillow like the curled up fox. I'm setting my budget for the toss pillows at $80 - roughly $20 a piece. That's dirt cheap and the reason is because it kills me to buy toss pillows when they are so easy to make. I'll probably go ahead and buy the kilim pillow from etsy, but I'm going to see what I can come up with for the rest. 3. This sleek black metal coffee table from Pottery barn is perfect, but at $399 it would definitely be considered a splurge. I could make yet another slip cover for the ottoman, it's comfy and nice to put your feet on, but I'd really like to try something different.